Telemarketing outbound calling motivation techniques to put you in a motivated energy filled state that allows you to use all your skills and experience to be successful. Use these techniques for you, or your team, and make telesales or appointment setting calls that are vibrant and alive. 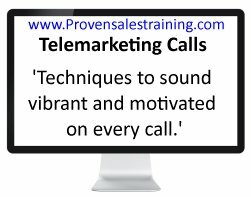 I've managed and trained telesales teams and appointment setters in call centres, and field sales people making their own cold calls. One of the obstacles to their success that I helped them to overcome was the way they sounded when cold calling for a period of time. Below are some of the causes of poor calls and two proven techniques to help you to avoid the same problems. A common problem, especially in call centres, is sitting for a long time and slipping into a posture that impacts negatively on the motivational state, energy levels, and the quality of the calls. It's one of the reasons you can tell immediately that an incoming call is a sales or telemarketing call. If you sit down for any length of time while making telemarketing outbound calls you either sink backwards into the chair and stretch your legs out, or you slouch forward and rest your head on your arm. These are positions associated with rest and sleep, or boredom and depression, not motivation, alertness and speaking with energy. A slumped posture and lack of movement slows down your breathing. The oxygen flow to your brain reduces and your ability to think and respond becomes impaired. Your voice reflects your slowed state and it becomes monotone and lacks any emotion or energy. If you are self employed, run a small business, or make outbound telemarketing calls alone, be aware of your physical and mental states, and their effects on your calls. You can't get motivated in a slumped or laid back body position. Try it, it just won't work. Although motivation is a mental state it is heavily affected by your physical state. It doesn't matter how motivating your business or personal goals are they won't provoke you into action if you're sat back with your feet up. To be successful and get the best results you have to be in a positive alert state at the start of every call. Thinking about your physical and mental states, and what to say on a telemarketing outbound call, can be a lot to focus on at the same time. One way to make this easier is to have a really good telemarketing call script so you know what to say and do at every stage of the call. It's one less thing to think about, and it gives you added confidence. The Appointment Setting Section of the website focuses on how to create an effective script for your sales appointment calls so you can make calls with ease and confidence. And the Sales Training Section gives you help to create a script for face to face selling and telesales calls. The key to making telemarketing outbound calls successfully is being, and sounding, motivated from the start of each call. To do this you need to be in a physical state, that supports your motivational state, and allows you to think quickly and use all your telephone skills, techniques, and experience. I've always encouraged the telesales teams, appointment setters, and sales people making cold calls, that I've managed and trained to stand up and move around. This keeps the blood flowing, the airways open, and the calls sounding vibrant. When you stand up you are more alert, more awake, and you can literally think on your feet. So no more slumping in your chair. 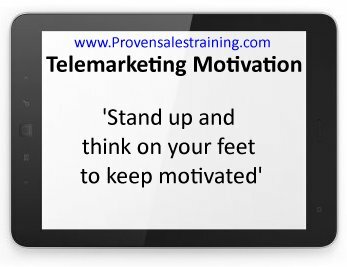 If you can stand up while making telemarketing outbound calls to your prospects then do it. If you have to sit down to see information or type into a computer then sit upright. Keep your head up and no resting on arms. Remember you will feel and sound as you look, good posture works in your favour. If you want to test this phone a friend and talk to them from different positions, lying down, sat back with your feet on a desk, slumped forward, head on hand and elbow on desk, and then stood or sat upright. Ask them for feedback, which sounded better, could they tell what position you were in. You will be surprised at the results. There's a reason why people say they are feeling down when they feel demotivated, sluggish, or even mildy depressed. There's also a reason why people talk about things looking up, keeping your chin up, or just feeling up. Look straight up and put the biggest, happiest smile you can on your face and think of something that makes you feel fantastic. Really go for it. Now keep your smile but bow your head so you're looking at the floor and notice the difference. My smile felt false as I lowered my head. My mind wandered internally and I lost my smile. I'm not really as happy when I look down. There was a contradiction as I looked downward. You can try this the other way around as well. Look down and put on the most miserable face and dark mood that you can, then raise your head and look upwards and feel the difference. If you look down at your computer screen or notepad from a sitting or standing position you will feel down. Your voice will reflect how you feel, it will sound lower, and your prospects will react to your voice. Looking down is great for reflection and internal dialogue, but not for getting into a motivated state and sounding really great on telemarketing outbound calls. Keep your gaze up whether sitting or standing. Ask yourself, do you need to look at your screen for all of your call or only when you have to input information. Combine the telemarketing tips above, take control of your body posture, breath naturally, keep your head up, and see the positive effects on your results and how you feel.